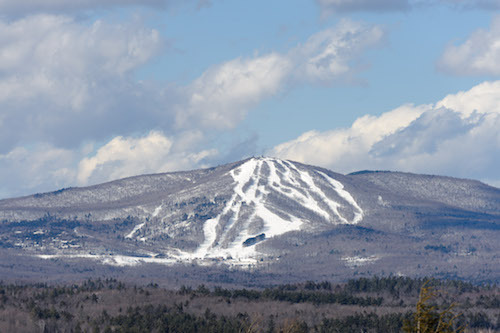 When you look into Mount Snow’s history, one of the most interesting things you learn is that its founder, Walter Schoenknecht, petitioned the Atomic Regulatory Commission to detonate an A-bomb on the mountain’s backside to increase its vertical. This was back during the Cold War, and fortunately for all of us, his request was denied. But that doesn’t minimize the role that Schoenknecht played in creating a lasting legacy in eastern skiing. This year, the mountain celebrates its 64th anniversary. 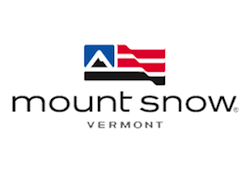 And although it’s been through several owners — Schoenknecht sold it in the early 70’s — Mount Snow been part of the Peak Resorts family since 2007. Resorts in the east live and die because of snowmaking, and Mount Snow just gave itself an enormous boost with a $30 million upgrade that doubles its previous capacity. This has been years in the making. 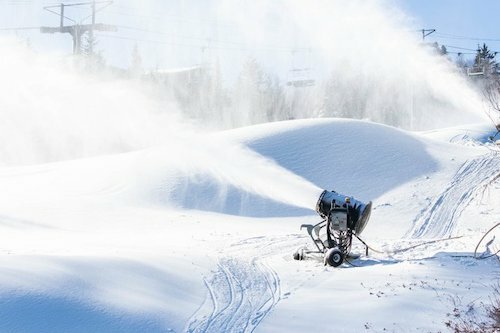 The mountain constructed an entirely new reservoir, installed a new pumping system complete with 3 pump houses and 18 miles of pipe, and added 220 new higher-efficiency snow guns. The result: a lot more snow, faster and more efficiently. Which means more snow on more trails earlier in the season, and faster recoveries from wild weather swings. I’m no wuss (well, maybe I am), but riding a lift while being hammered by the wind is not my idea of a good time. The Blue Bubble, otherwise known as the Bluebird Express, has a shield you can pull down for protection from the elements. And yeah, it makes a huge difference. 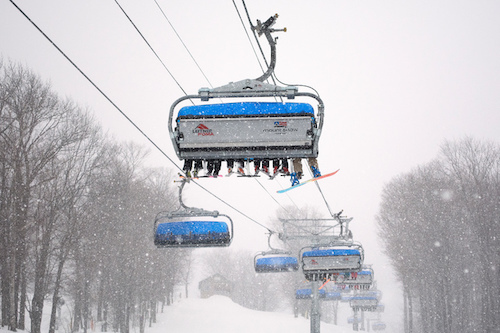 Mount Snow installed its six-pack bubble chair in 2011, and it’s the go-to lift on a blustery day. The best terrain park in the east. I don’t play in the park, but if I did, this is where I’d come. 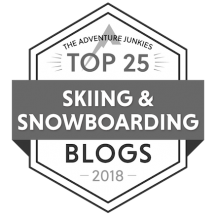 Newschoolers.com named Mount Snow’s Carinthia Park #1 in the East in 2018, and it’s made top ten lists all over the place ever since it opened in the ’08-’09 season. The park encompasses 100 total acres of terrain with nine different terrain parks ranging in size from small features to extra-large features, plus a 400+ foot superpipe with 18-foot walls. Mount Snow was cohost of the first Extreme Games in 1995 and host of the Winter X-Games in 2000 and 2001. If there’s been a shortfall at Mount Snow, it’s in the base lodge department. The main lodge has been around for a long, long time, and truly, it wasn’t built to handle the amount of traffic it gets, particularly during weekends and holidays. 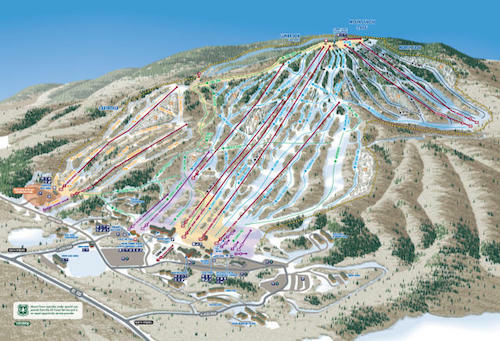 Mount Snow is working big time to change this by building a $22 million dollar 42,000 square-foot lodge. 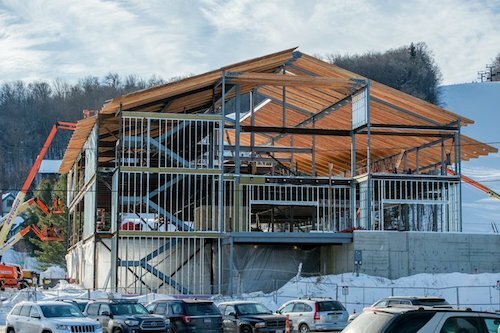 Slated to open for the ’18-’19 season, the lodge will have seating for 500 people and house a full-service restaurant, a cafeteria, two bars(!) and a coffee counter. It’ll also have a rental shop, a tune shop, lift ticket and ski school sales, a retail and convenience store, and bag storage. The area will also feature a new parking garage as well as 102 2-3 bedroom rental units measuring from 1,600 to 2,800 square feet. I had a great day skiing Mount Snow. The terrain is lots of fun, the mountain easy to navigate — the blues are in one section of the mountain, the blacks in another, and the terrain park entirely separate — and the people who work there are friendly and engaged. If you’re looking for a place to ski in southern Vermont, this is it. Give it a try. PreviousYes, I love skiing. But here are some things I’d change. NextHave you ever ski biked? I have — and it’s a blast!